Initially the project was conceived in 1950 and Architect Mr JA HOOGTERP had offered to carry out the planning but had to later withdraw. Mr RF McGAW was appointed in his place. The design for the Memorial allowed for a small cenotaph formed of a concrete shell clad externally in thin granite slabs with granite external facing and decorative gates each side. 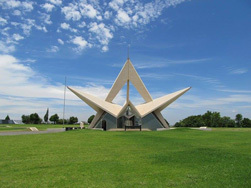 A road deviation scheme threatened the old memorial and so a new site was procured for the proposed new memorial and its prominence in respect of the new site, the SAAF and SAAF Association decided to proceed with a national architectural competition for the new design, subject to the conditions advised by the Institute of South African Architects (ISAA). Professor John FASSLER was appointed as the assessor. The competition was proceeded with and professor Fassler named the winner, chosen from 38 entries, as Taylor & Taylor of Johannesburg, with McLennan & Zeffert in the second place, and HC Floyd of Cape Town in third place. HC FLOYD as well as one or two other competitors designed the Memorial as an underground construction. The design of John and Shona Taylor visualised the beautiful construction that stands on Bays Hill today. The original bronze eagle together with the original granite inscriptions and certain paving from the Waterkloof Memorial were incorporated into the new design. 'One of South Africa's great monuments, an inspired sculptural building, symbolic of flight ... ' (Greig, 1971: 223).